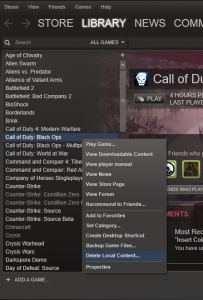 *** Edit: Sometime in the last few months Steam added a new feature, Steam Library. You can create multiple locations on the same drive, different drives, or even networked drives to install games!. Networked drive sounds nice! Useful if anyone is running a Cafe of steam users. Delete/backup games you don’t play? Use mklink to point all or specific games to another harddrive or network location. You could just delete the games you don’t want. Or Above the ‘Delete Local Content’ option is ‘Backup Game Files’. Now it will backup all the games files with compression to a location you pick. It can even break the backup sets into 700mb (CD size) or 4.7GB (DVD sizes) or any custom size. Move your steamapps folder to your destination (Z:) first. Because source folder must not exist. Could also do parts. like “C:\Program Files (x86)\Steam\steamapps\common” or “C:\Program Files (x86)\Steam\steamapps\username” to different locations if needed.